Here, you are looking at the Volk Racing Rays 17 Hex Lug Nuts. 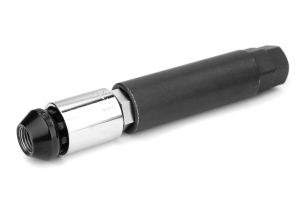 This is a great way to secure the wheels to your vehicle and they come included with special lug sockets. Choose the right color to suit the theme of your vehicle. Great quality in fit, finish and material. Product shipped and received in two days time standard delivery. These are very nice lug nuts. I have had them only a short amount of time, but after serving the car several times these show very little wear. Quality you can feel. 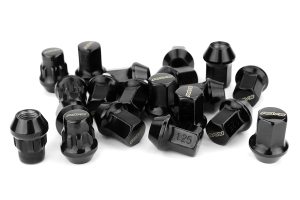 These lug nuts are great for daily drivers because of how durable they are. I've had to remove my wheels countless times for maintenance procedures such as changing brake pads, upgrading suspension arms, fixing wiring harnesses etc and these lugs hardly show any sign of wear. The locking nut aspect is also very good to have and the reason why I like these the best is because a potential theif can't just buy a set and use the key to steal your wheels. Rays makes it difficult for anyone to take that route by making 15~ or so key patterns and this product gives you just that much more piece of mind. When your wheel and tire setup is worth probably 1,000 dollars per corner you'll want every layer of security you can get. Work as advertised. Angle fit my Team Dynamics wheels perfectly. 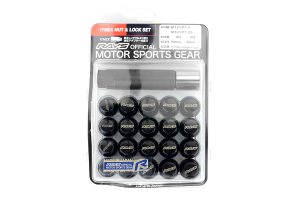 Will these lug nuts fit my 2017 WRX premium? A: Sadly, we cannot confirm lug nuts on our site to the stock wheels. 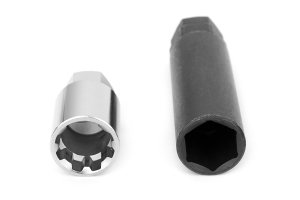 Hello, I was wondering if you have a picture referencing these lug nuts or a L32mm or L42mm rays mounted on a pair of TE-37 Saga's. If not, how far would these stick out from the wheel. I'm looking for something that is flush or almost flush to the top of the lug hole Thanks! A: We're not sure how that would look, we cannot confirm fitment or how they are going to sit as there are too many variables that go into the question at hand. I change my wheels annually for the seasons, and have always used Subaru's OEM lug nuts, but find the ends blow out when torquing them. This damages the plating and they begin to rust and look terrible. Since these lugs are close-ended, will I encounter the same issues as the OEM? A: The only reason that happens is if you over torque the lugs. Keep in mind you don't want to use these on OEM wheels. A: Volk makes a high quality lug nut and we have not seen any issues with rusting under normal use and condition. Like anything, if dropped or damaged outside of normal use, the coating can scratch. Will these lugnuts fit a 09 wrx hatch? A: These are the correct thread pitch for your car. Please note that these lug nuts have a 60 degree taper seat and are only recommended for aftermarket wheels.